Yeti derailleur hanger shop on line. Yeti 575 2004 - 2010 derailleur hanger 6061 T651, made with CNC technology. Black anodized. Lighter and more durable than the hanger series. Yeti 575 2011 - 2014 derailleur hanger 6061 T651, made with CNC technology. Black anodized. Lighter and more durable than the hanger series. 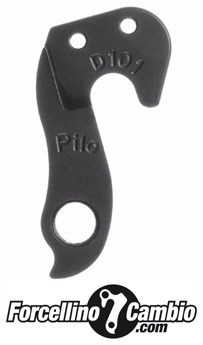 Yeti Arc 2004 - 2010 derailleur hanger 6061 T651, made with CNC technology. Black anodized. Lighter and more durable than the hanger series. Yeti Arc X 2004 - 2010 derailleur hanger 6061 T651, made with CNC technology. Black anodized. Lighter and more durable than the hanger series. Yeti ASR 2004 - 2010 derailleur hanger 6061 T651, made with CNC technology. Black anodized. Lighter and more durable than the hanger series. Yeti ASR5 Alloy 2014 derailleur hanger 6061 T651, made with CNC technology. Black anodized. Lighter and more durable than the hanger series. Yeti ASRC 2010 derailleur hanger 6061 T651, made with CNC technology. Black anodized. Lighter and more durable than the hanger series. Yeti ASX 2004 - 2010 derailleur hanger 6061 T651, made with CNC technology. Black anodized. Lighter and more durable than the hanger series. Yeti Kokopelli 2004 - 2010 derailleur hanger 6061 T651, made with CNC technology. Black anodized. Lighter and more durable than the hanger series. Yeti SB66 2013 derailleur hanger 6061 T651, made with CNC technology. Black anodized. Lighter and more durable than the hanger series.